If they are genuinely worried about impacting farmers, then they need to do the right thing and wait until next year to commence construction instead of arguing that delays will cause them to work during two growing seasons. No one asked them to jump the gun on “pre-construction” clearing and cutting. No one asked Dakota Access to stockpile materials throughout our state. They are using these activities to pressure public servants, farmers, and elected officials all over our state. 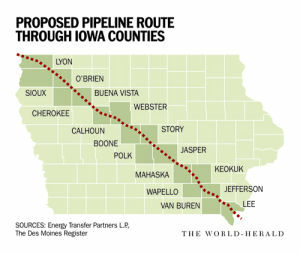 The IUB needs to stop rewarding Dakota Access for behavior that is far from “Iowa Nice”. Within the form choose “other” and say “Dakota Access is NOT a utility” then tell them that it benefits no one to allow construction to begin early. This entry was posted in Climate Action, Climate Change, Corporate Greed, Environment, Environment Iowa and tagged #nobakken, Dakota Access Pipeline. Bookmark the permalink.